One of the world leaders in sound head-wear are going out with the old, in with the new. Plantronics – the people behind the sound gear over at NASA – are releasing something cool and we’re telling you about it right here on The Gadget Grill. While I wouldn't suggest wearing them out in public, the red grates on the cans do make these look stylish. Okay… it’s a pair of headphones. That wasn’t hard. Not hard in the slightest. Plantronics’ new GameCom 377 headphones are a set of well engineered headphones that build upon past success of Plantronics design with a look that today’s gamers will probably love. Built to last, the GameCom 377’s are cast in the mold that Plantronics have been using from all their past high-end headphones. Previous models included the 360, 365, and a few others. I’ve owned all of those models and both the sound & build quality have been excellent. 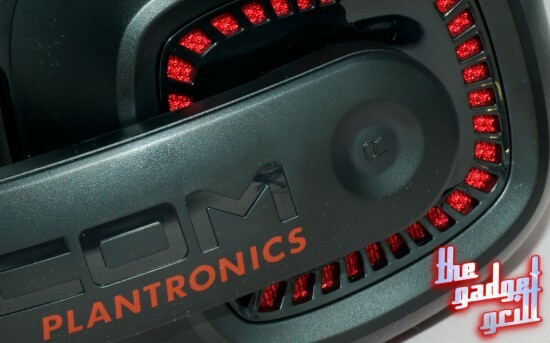 The GameCom 377’s continue that tradition with new looks, a new microphone, better controls for handling that microphone, and the ability to have an “open” set of headphones for what should be better sound. From the get go, you’ll find the headphone quality to be good. 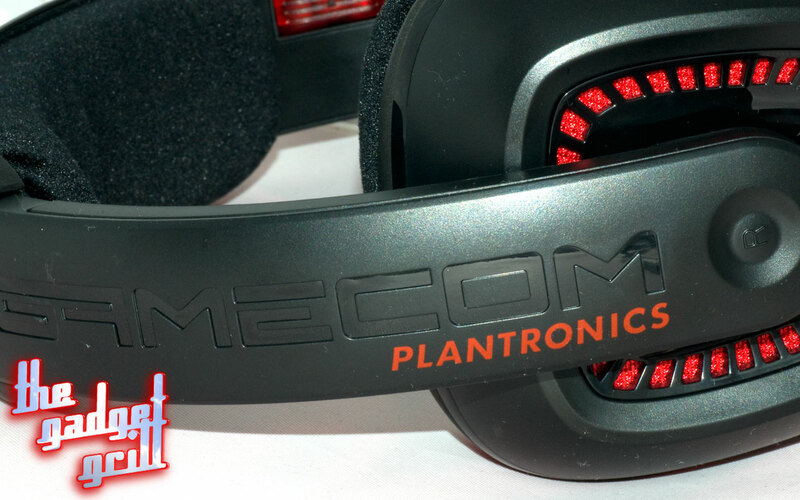 Reviewing headphones is a highly subjective area but I found the GameCom 377’s to be fairly balanced. It’s clear that gamers are the market here as there’s a little bit more bass than I’m used to but everything sounded decent through it. From the jazz, classical, rock, and electronic mix I normally test with all the way to playing a few games, the sound was clear and vibrant. You can still hear a little bit of what’s going on around you thanks to the “open” state of the headphones and this helps to let the sound be a little more free around your ears. Essentially, this improves the quality of the audio giving you a clearer sound. It’s obvious that Plantronics have done some work here & there, and I’d go out of my way to say they’re better than the last generation of headphones I grabbed from them. The microphone looks a little like a "red alert" button up close. Sadly, it doesn't light up. It’s not just the headphone quality though. The microphone seems to have taken a step forward from past Plantronics headsets as voice quality now seems a little bit better defined than what it used to be. Whereas the voice on past generations seemed to be just treble-focused, there’s now some bass that’s evident on this microphone. That’s good to hear and if you’re doing podcasts on the cheap, the microphone on this headset will work nicely. Furthermore, the microphone controls are now flatter and easier to read than ever. 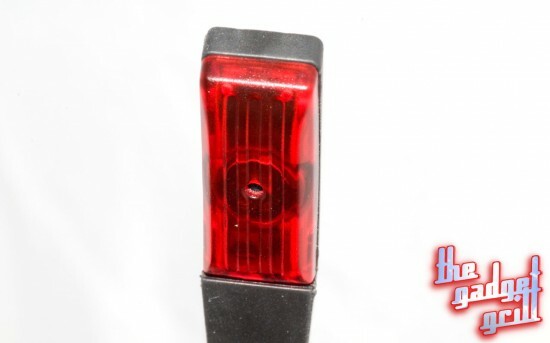 Instead of just being a simple wheel, you now get some level of pictographs telling you how loud your headphones will be as well as the old microphone switch that lets you turn it on and off quickly. We personally found it easier to leave the microphone off and push the flexible mic back into the headband than leaving it out. 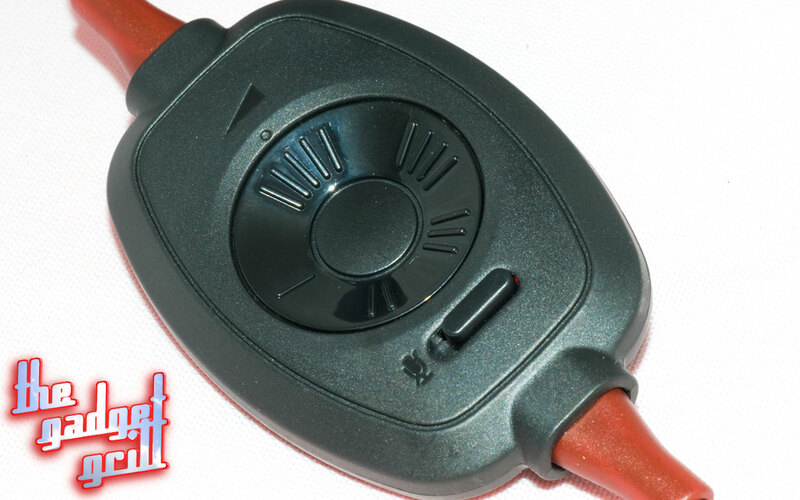 The new volume control piece with microphone switch makes it really easy to see just how loud your headphones are. The marketing speak claims that the GameCom 377 (as well as the GameCom 367) has “rugged, military grade design,” and whilst I don’t know if that’s exactly true, I would go out to say that they are strong. They’re not flexible in the way many other headphones are and I wouldn’t suggest these if you’re ultimately looking at portability. What they are, however is rigid enough to survive the sort of torture a gamer might fling at it. Stick them in your backpack & throw them on a desk, and the backbone survives, a plastic head-wrap with a nice plush feeling to keep your neck happy. Interestingly, while we’re usually quick to find the faults in a product, this was one where we couldn’t find many. They’re comfy headphones that sound good and provide decent microphone ability for not too much money. Hell, even the cable used on the headphones feels stronger than that of previous generations. We tried desperately to see if the plush ears would annoy us after a while but they didn’t. About the only thing that might throw you off the scent of these cans is the red styling, but if you’re a gamer I’d say that might improve the chances of you going out and getting it. To be honest, the looks are better than some of the gamer-targeted Sennheisers I’ve seen in recent months. If you’re after a decent set of headphones that are comfy and include a microphone,you should definitely stop and see if the style of the GameCom 377 match what you’re after. With the use of open-ear technology, they will produce a little bit of noise but you should get such a clear sound that it’s easily worth it, especially with a street price of between 50 and 70 bucks. I am thinking of getting these. I was going to get the creative white ones with removable mic because they were on sale for $40, but I didn’t have cash. Now I’m probably going to try these and see how they are.